TORONTO, Canada – September 12th, 2016 — ITC Systems is announcing that its new PayStation ELITE pay-for-print/copy solution now supports PrinterOn, the industry’s leading secure mobile and remote printing solution. This support will enable ITC Systems to deliver cash-based and cashless payment solutions for print jobs submitted from wireless print services anytime, anywhere through its PayStation ELITE. This support will create opportunities for companies and institutions where a Pay-4-Print environment exists, says ITC Systems CEO Campbell Richardson. ITC Systems provides integrated transaction control solutions for copy and print control customers around the world. 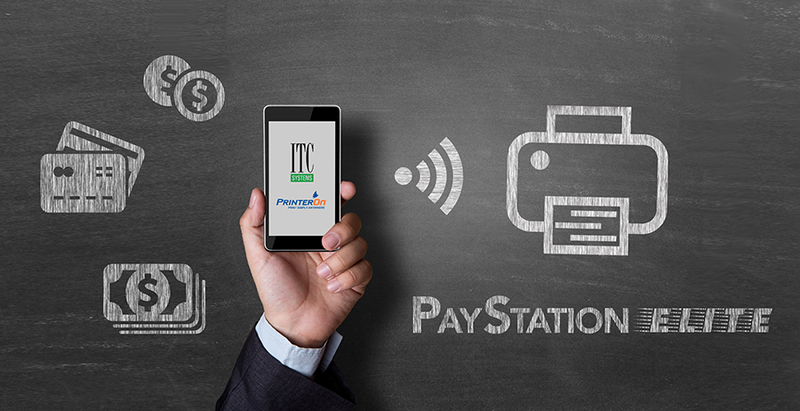 The PrinterOn technology partnership means ITC Systems’ can now offer PayStation ELITE to PrinterOn’s customers in order to facilitate print vending anyplace that has an internet connection. In addition, ITC Systems PayStation ELITE will also interface with most MFD’s (Multi-Function Devices) on the market to provide copy services along with PrinterOn’s print delivery system. Mr. Richardson says the PrinterOn support aligns with the ITC Systems’ focus on expanding the company’s global reach through collaboration. “This is a superb opportunity for us and we’re all excited about embracing the opportunities that this new solution support represents for our customers,” he says. Tom Barber, Senior Director of Sales and Marketing at PrinterOn, is also pleased with the new arrangement. ITC Systems, a multi-national corporation with offices in St Louis, San Francisco and Toronto, is the industry’s dominant manufacturer of self-serve unattended cashless payment terminals in North America. Founded in 1989, the company maintains a large dealer network throughout North America and Internationally. ITC Systems markets to colleges and universities, copy/print VAR’s, food service corporations and other closed institutions that charge for the use of products and services in self-serve and unattended cashless environments. Applications include POS, copy and print control, food service outlets, vending, laundry, parking and other cashless applications. To learn more about ITC Systems, please visit www.itcsystems.com. PrinterOn is the world’s leading Enterprise-grade secure mobile printing solution. PrinterOn delivers secure mobile printing solutions to major enterprises, schools, and public printing locations in over 100 countries. PrinterOn enables secure mobile printing from any smartphone, tablet, or laptop to any PrinterOn-enabled printer in the world. PrinterOn is a wholly-owned subsidiary of Samsung Electronics.